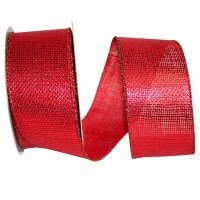 This Red Burlap Metallic Ribbon is ideal for a wide range of projects. This Metallic Burlap Ribbon will make a great addition to floral arrangements, gift packaging and everything in between! At The Ribbon Diva, you will find a huge selection of Metallic Ribbon in a variety of colors, widths & style to please everyone!